The Securities and Futures Commission (SFC) published a consultation paper1 on 27 November 2015, proposing the expansion of the scope of the short position reporting regime and corresponding amendments to the Securities and Futures (Short Position Reporting) Rules (Short Position Reporting Rules). Daily reporting will apply in contingency situations to those Designated Securities specified by the SFC in a public note. The Short Position Reporting Rules came into effect on 18 June 2012, with the purpose of introducing the short position reporting requirement for constituent stocks of the Hang Seng Index (HSI), the Hang Seng China Enterprises Index (HSCEI), as well as other financial stocks specified by the SFC. This is due to the fact that the requirements were introduced after the 2008 stock market crash, following the collapse of Lehman Brothers in September 2008 and the subsequent emergency measures introduced by a number of major overseas markets. In response, the International Organisation of Securities Commissions (IOSCO) published the Regulation of Short Selling final report in June 2009, which set out four high-level principles for effective regulation of short selling, including one which relates to the merits of enhancing transparency on short selling: it was recommended that "short selling should be subject to a reporting regime that provides timely information to the market or to market authorities." The report led to the implementation of short position reporting or short position disclosure requirements in a number of overseas markets, including Australia and the European Union. Given the global regulatory developments, the SFC introduced the Short Position Reporting Rules in Hong Kong. At the time, the SFC only introduced the reporting obligation for constituent stocks of the aforementioned HSI and HSCEI and other specified stocks, as it was mindful that the obligation was new to the market and would increase the compliance burden of market participants. The SFC indicated therefore that the scope of stocks subject to the regime might be expanded in the future. Based on the current obligation, as of 30 October 2015, a total of 127 stocks3 were subject to short position reporting. 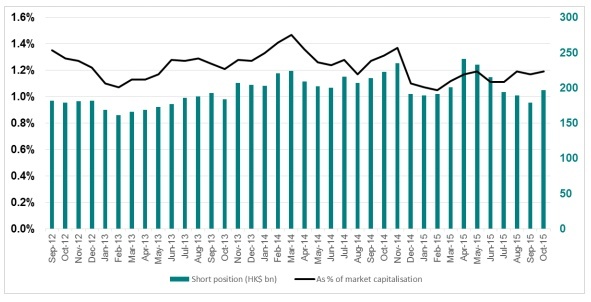 With a view to increasing market transparency of short selling activities in Hong Kong, in accordance with the Short Position Reporting Rules, the SFC has been publishing aggregated short positions based on short position reports on a weekly basis since September 2012. The aggregated market value of short positions has typically been in the range of 1.0% to 1.5% of the total market capitalisation of the stocks that are subject to reporting. As of 30 October 2015, the market value of the aggregated short positions was HK$197 billion, compared to HK$191 billion as at the end of 2014 and HK$204 billion as at the end of 2013. The top 10 stocks with the largest short positions by market value accounted for about 50% of aggregated short positions. Of these, 6 were HSI constituent stocks as of 30 October 2015. Investment banks are the top short position holders. Other holders included funds, market makers and individuals. The SFC proposes the following changes and enhancements to the Short Position Reporting rules to increase transparency and to better monitor short selling activities, in light of their potential implications for the orderliness and stability of markets. The SFC is of the opinion that there is a need to expand coverage of the Short Position Reporting Rules to obtain more comprehensive information on short selling activities. As of 30 October 2015, there were 889 Designated Securities on the list of SEHK. The aforementioned 127 stocks currently subject to short position reporting is a subset of the Designated Securities. The list of Designated Securities includes stocks and collective investment schemes which include exchange traded funds (ETFs), real estate investment trusts (REITs) and other unit trusts/mutual funds. The SFC estimates their aggregated short positions could be over HK$100 billion. The Designated Securities include many stocks which are not index constituents. This is of concern as some of them recorded active short-selling turnover. Short selling runs the risk of exacerbating selling pressure; therefore, there is general concern that the use of short selling together with abusive trading strategies could increase the risk of a disorderly market. In light of the current market climate, the SFC believes changes are necessary. At the time the regime was introduced, the trading of collective investment schemes only accounted for 4% of the total market turnover. The percentage increased to 9% for the period January - October 2015. During the same period, short selling turnover of collective investment schemes accounted for about 24% of daily trading of these collective investment schemes and 22% of daily short selling turnover of the entire Hong Kong market. ETFs were the most actively short-sold collective investment schemes. For the period January - October 2015, two ETFs were among the Designated Securities with the highest short selling turnover. Their average daily short selling turnover exceeded HK$700 million. In considering the proposals, due regard was also paid to international markets. The EU, the US, Australia and Japan all require short position reporting on all stocks in general. The SFC proposes to expand the scope of the existing Reporting Threshold, in light of the current market climate. Under the current regime, the Short Position Reporting Rules provide that a person has the obligation to report to the SFC, if at the end of the last day of the trading week, that person has a net short position in any of the specified shares (as defined in the Short Position Reporting Rules) that is equal to or exceeds 0.02% of the market capitalisation of the listed issuer concerned or HK$30 million, whichever is the lower (Reporting Threshold). The Reporting Threshold was set in 2012. At the time, the SFC took into account the size of the listed companies, market capitalisation, liquidity, the type of market participants and investors and their trading activities. Recognising the market value of the additional securities proposed to be included in the Short Position Reporting Rules are generally smaller than that of the index constituent stocks, the SFC notes that it can be argued that a different reporting threshold trigger ought to be considered for these other securities. That said, the SFC is minded to maintain a simple reporting regime so as to avoid the reporting regime becoming overly complex should different reporting thresholds apply to different classes of stocks. Consequently, under the expanded scope, the existing Reporting Threshold will apply to all Designated Securities, except those that are collective investment schemes. For those Designated Securities that are collective investment schemes, some are open-ended collective investment schemes, and it would be impractical and inappropriate to set the reporting threshold by referencing them to market capitalisation given that the value of market capitalisation depends on the total number of outstanding units or shares. Instead, the SFC is proposing that a person will have to report to the SFC, if he holds a net short position in a collective investment scheme with a value that is equal to or exceeds HK$30 million at the end of the last trading day of a week. As Designated Securities can be traded in a foreign currency (currently including US dollars and renminbi), the SFC proposes that where the trade price is in a foreign currency, the closing price should be first converted into Hong Kong dollars (HKD) to determine the value of a net short position. The rate of exchange used would be the rate for the foreign currency which is the buying rate for telegraphic transfers on the reporting day, as determined by the Hong Kong Monetary Authority (HKMA). For those Designated Securities which can be traded in multiple currencies, to determine whether a person has a reporting obligation, he would first have to convert the value of his position in the foreign currency counter into HKD, as above, and then include that in his position in the HKD counter. If the value of his net short position exceeds the relevant reporting threshold trigger, he will have to report his position to the SFC. At present, the Short Position Reporting Rules give the SFC the power to require daily reporting on all the specified shares in a contingency situation. At least 24 hours' notice will be provided to all market participants before the daily reporting takes effect. When the SFC believes that daily reporting is no longer necessary, it will issue a public cessation notice to notify market participants. The SFC notes that once short position reporting is extended to cover all Designated Securities, it could be operationally burdensome for both the SFC and market participants if daily reporting of short positions in all Designated Securities is required. The SFC therefore proposes that, in contingency situations, the SFC will determine the Designated Securities that will be subject to daily reporting (Daily Reporting Securities). The SFC will issue a public notice identifying the Daily Reporting Securities before daily reporting takes effect. Depending on the prevailing market situation, the SFC may decide to stop daily reporting on one or more of the Daily Reporting Securities. The SFC also reminds market participants that they must complete the Form in accordance with the directions and instructions set out in the Notes. Failure to comply may result in the market participant being deemed to have not complied with the Short Position Reporting Rules despite submitting the reports. The SFC proposes to amend the Short Position Reporting Rules to make it clear that market participants must follow the directions and instructions provided by the SFC regarding the use of the designated electronic system and the submission of short position reports. Further, paying due attention to the rapid evolution of technology, the SFC envisions that there may be more than one electronic system to be adopted to report short positions in the future. As such, the SFC would like to take this opportunity to provide greater flexibility in the Short Position Reporting Rules. It is the SFC's future intention to provide for an alterative electronic system for reporting. However, market participants are expected to continue using the existing arrangements for reporting short positions. To extend short position reporting to all Designated Securities which currently comprise stocks and collective investment schemes, the definition of "specified shares" in Rule 2 and the list of specified shares in Schedule 1 are revised. The existing threshold trigger for reporting short positions in stocks remains unchanged and the threshold trigger for reporting short positions in collective investment schemes will be set at HK$30 million. Amendments are made to Rules 3(1)(a) and 3(2)(b). New Rules 3(2)(ba) and 3(1)(b) are introduced. Rule 3(2)(c) is amended to cover a situation where the closing price of a Designated Security is in a foreign currency, it must be converted into HKD at the rate of exchange for that foreign currency as specified in Rule 3(2)(d). In a contingency situation, daily reporting on short positions will apply to a specified list of Designated Securities. A new Rule 7(2)(aa) is introduced to serve this purpose and consequential amendments are also made to Rule 4(3). Depending on the then prevailing market situation, the SFC may decide to stop daily reporting on one or more Daily Reporting Securities. Amendments are made to Rule 7(3) to provide for such flexibility. To enable the SFC to designate more than one electronic system to report short positions, Rule 4(9) is replaced by a new Rule 4A. In addition, consequential amendments are made to Rules 4(2), 4(4), 4(8), 5(1) and 5(2). The new Rule 4A also clarifies that a short position report will only be regarded as submitted if it is submitted in accordance with the directions and instructions published by the SFC for the use of the electronic system. The removal of the definition of "business day", in view of amendments made in 2012 to section 1 of Part 1 of Schedule 1 to the SFO. The SFC invites interested parties to submit written comments on the consultation paper, the policy proposals and modifications to the Short Position Reporting Rules to reflect the proposed enhancements. All comments must be received by 31 December 2015.